Students reverently bow their heads as Gideons lead them in prayer. © 2014 The Gideons International. 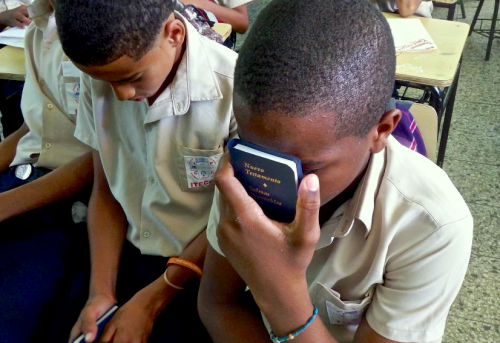 In November, local Gideons in the Dominican Republic’s capital city of Santo Domingo conducted an International Scripture Blitz. An international team of Gideons from the USA, Germany, and the British Isles had come to assist them, led by the blitz team leader, International President of The Gideons International, Dr. Bill Thomas. Months of prayer and planning by members around the world went into preparing for this seven-day event. Would their goal of distributing 140,000 Scriptures prove to be too ambitious? 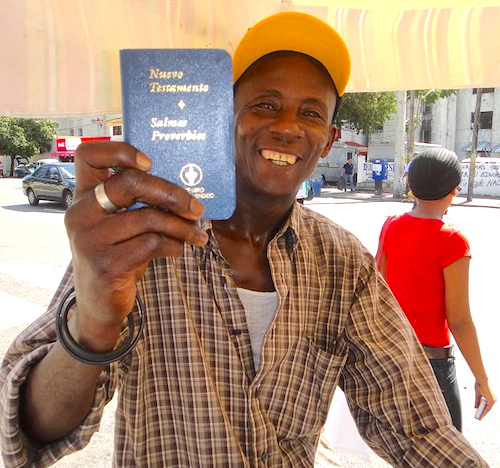 Would the people of the Dominican Republic be open to receiving God’s Word? Would Gideons get opportunities to personally witness and help lead men, women, and children to a saving faith in Christ? Located on the island of Hispaniola in the Caribbean, the Dominican Republic represents the eastern part of the island. The rest of the island comprises Haiti. About one million of the nation’s ten million citizens live in the capital city of Santo Domingo. During the blitz, Gideons experienced a number of challenges¬–ranging from language barriers to extreme heat, and torrential rains that left a foot of standing water in some roads. However, God was in total control. None of the challenges could stop this Spirit-filled team from sharing God’s Word with students and faculty at 183 schools and three universities they visited. Outside of one of the shopping malls, Dr. Thomas came face to face with a parking attendant named Claudio. “Do you believe in God?” Dr. Thomas asked the young man. “Yeah, I think so,” he replied. “Well do you know where you will go when you die?” Dr. Thomas asked him. Claudio admitted he didn’t know the answer to that question. And for perhaps the first time in his life, he realized he needed to know. So there in that parking lot, Dr. Thomas opened a New Testament and shared the message of the Gospel with Claudio. And with his permission, they led him in a prayer as he asked Jesus to enter his life as his personal Lord and Savior. Just one of the over 160,000 Scriptures distributed during the 2014 Dominican Republic blitz that is now making an eternal impact. © 2014 The Gideons International. Gideons had been praying for months for open doors to distribute Scriptures on this island. As it turned out, the doors were opened to an even greater extent than anticipated. Nearly everyone they offered a Scripture to accepted one. There were the many school teachers who said, “Please come in and share Jesus with our students.” And there were the students, whose faces glowed with excitement as they received their own personal copies of God’s Word and made public decisions to receive Christ into their hearts. “Everybody on the team caught the vision of reaching the lost for Jesus,” said Dr. Thomas. Robinson Candelario, a leader in The Gideons International in the Dominican Republic, was instrumental in coordinating the Gideons’ activities for this event. By the end of the event, the team had exceeded their original distribution goal by more than 20,000 Scriptures, for a total of 160,447 Scriptures distributed to the people of the Dominican Republic. We thank everyone who participated in this blitz. And we thank the many pastors, members, donors and other supporters whose prayers and donations helped make this blitz a great success. And most of all, we praise God and give Him the glory for all that His Word will accomplish as it continues to go forth in the Dominican Republic. distributing thousands of Bibles…Praise our GOD…Praise our GOD !!! God is still in the business of saving souls. Why shouldnt we be a part of it? Felicidades siempre adelante,saludos desde Nicaragua.